For the Matterport media release, please see this MUG Forum thread. Dan so the outdoor solution is a software solution? I was under impression it would have to be in the hardware (lens) .. This is a great announcement .. So let me get this strait, the exterior shots are with the MP camera and can be viewed on the Ipad but the software is not going to give you an error message to fail to align with previous or next scan. I saw you can switch to see different views from Ipad and the video real, so all is uploaded and the software when model is complete it will give use the separate views. Can we have as many exterior shots as we want and will the exterior shots count as a scan in the overall scan count. So if we do 5 exterior scans then can we only do 95 interior scans before we are billed an additional $20. Also if these are all processed together, I was told by tech support that the software attempts to balance the color/white balance over all scans, are they going to process this the same way, which is a concern I have. I know this is a lot but I hope they release more info. Thank you. Sounds like it is just a software update with the ipad to tell the camera to take one shot so there is no stitching going on so it doesn't have to worry about aligning with other shots. My understanding was the lenses were having a hard time aligning with other shots due to the harsh lighting. This way each shot is its own stand alone 360 shot. Nice job finding a way to provide 3d scans without having to stitch them together. Dan, does this kind of negate your need for your theta s to do your outdoor shots that also are disjointed from the scans or do you still see your 360 camera being useful? Thanks for the video. I am excited to try this out. We are doing a large wedding venue and could see it being nice to add some scans of their outside areas they could put on their website. 2nd - anyone thought of scanning a furniture store or something similar now that we can link in the tags and have those link to items on their website? Any release date announced yet? Greg, can you only do one single shot or several? I must have missed it can we now attach links to mattertags? Always one step behind everybody else. My understanding is you can do multiple scans they will be in the highlight reel ... Mattertags will be able to have hyperlinked content. @ron0987 not sure I understand your question, but from what I gather you can take multiple outdoor shots as you can see in the video he has a whole bunch of tiles from outdoor shots, but they are not stitched together and seem to be separate from the house scans. So you could do a bunch of the back yard but they would each be an individual 360 view rather than it all stitched together like the indoor matterport scans. It's possible to do regular scans that are part of the house but the hard thing has been lighting because the harsh light won't let the camera align with other scans. This way the matterport camera is acting more like a traditional 360 camera without the fish-eye look. Again, this hasn't been released yet and I am just going off the video Dan did with the Matterport rep showing the new feature. Also I am not sure the mattertags linking is available yet but should allow you to have a tag be a hyperlink to wherever you want. Sounds cool and something we tried doing before but couldn't for a property we did for a home builder that wanted people viewing the property to be able to be taken to options page, or community page, etc. 360º Views are viewable only in the highlights reel. They (presently) can not be linked together. For example, one might expect a 360º outside the front door of the house and then you walk inside the house. Nope. While that feature has not been announced, I could imagine Matterport is trying to figure-out how to do that. Perhaps with Mattertags?! No hardware required for 360º Views, once available. While I previously thought it would be a firmware update - and perhaps it is - I saw in the demo that the Matterport Capture app is different. You toggle between scanning and shooting 360º Views. Good question about pricing. I do not know. I could imagine that Matterport counts them like a scan to keep the explanation simply. My impression is that the camera's data capture is turned off when creating 360º Views. So, it's just like shooting 6 imagines around (hopefully it's HDR with 18 photos). About your Theta question, I will start a new thread on that topic. Stay tuned. I recall from Inman Connect that Mattertags would be ready by the end of August and 360º Views (should) be ready by the end of September 2016. If I missed a question, please ask it again. At 3:08 pm EDT today (18 August 2016), Matterport sent the following email to it's customers. 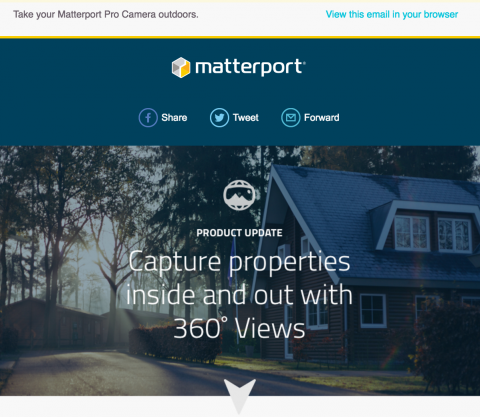 For the Matterport User Group Forum discussion of Matterport 360º Views, please visit this MUG Forum page. Take Matterport Pro Camera outdoors. The upgrade you've been waiting for has finally arrived with 360° Views. 360° Views are like 3D scans but they only collect visual imagery data (no depth data); therefore they are not connected to your 3D Space. They are perfect for bright sunlight and outdoors, large spaces where alignment is not necessary, or showing off the exterior of any Space. Take your viewers to these places via the Highlight Reel in your 3D Showcase. To get started with 360° Views, simply upgrade your Capture app and follow the steps listed on our Support page. Click the link below to read more about 360 Views on our blog.